A delicate lace pattern covers these square pottery plates in a texture that can be easily felt as well as seen. A transparent cream white with black accents glazes nearly half the plates while a complex glaze of antique red and flowing white highlights the lace pattern on the other half of the plates. The mug's colors and textures match those of the plates. They have been both thrown and hand-built in order to achieve their texture. The plates, however, were entirely hand-built. 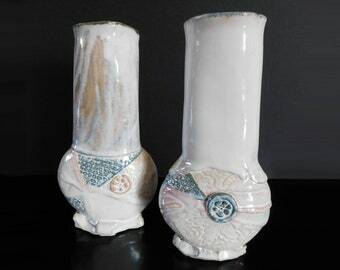 They have all been dry footed so that wherever they touched the kiln shelf their bottoms are unglazed. The lace pattern placement differs from place setting to place setting. The large plate measures 8 3/4"(22.2cm) by 8 3/4"(22.2cm) by 3/8"(1.5cm) ($25). The small plate or saucer measures 6"(15.2cm) x 6"(15.2cm) x 1/2"(1.3cm) ($15). 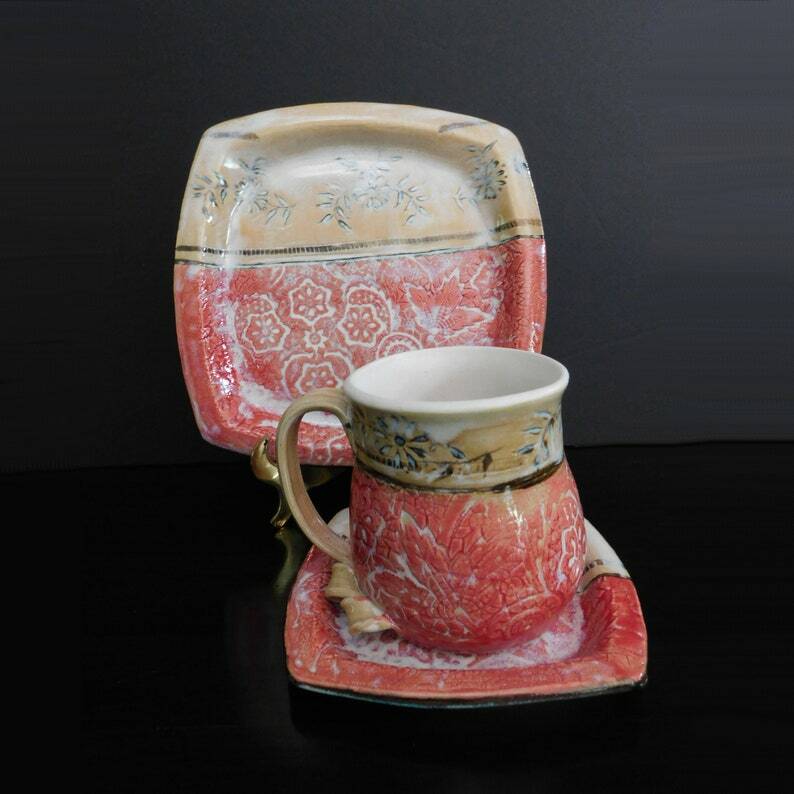 Of the above pieces 5 large plates, 6 small plates and 5 mugs are available immediately for shipment. If serving pieces or individual serving bowls are wanted, a custom order would need to be placed. Please be aware that colors, sizing and pattern placement will vary somewhat from kiln load to kiln load since all items are hand made. Since they are made of stoneware clay they are dishwasher, and microwave safe.